With Labor Day 2013 just ending, this seems like a point worth highlighting in a bit more detail. Environmental Entrepreneurs (E2) last week released a report that did just this (while also including some interesting and useful information about jobs from other clean power and clean transportation sectors). 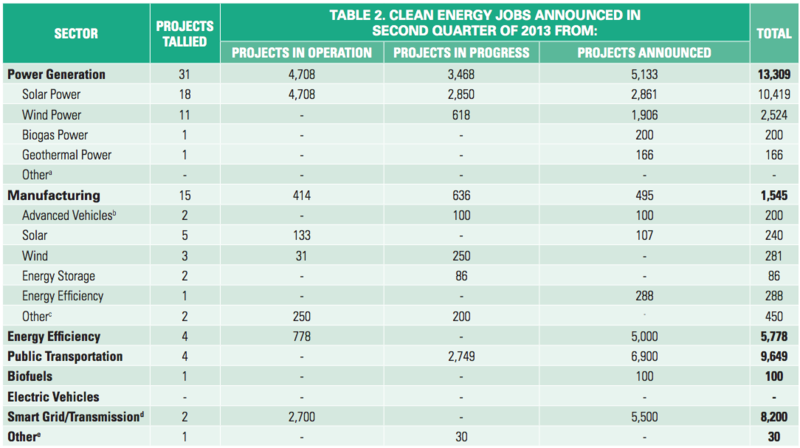 Below are a few key details from the report, which is titled, Clean Energy Works For US: 2013 Second Quarter Clean Energy / Clean Transportation Jobs Report [PDF]. More than 119,000 Americans work in the solar energy industry, with 13-percent year-over-year job growth between 2011-12. 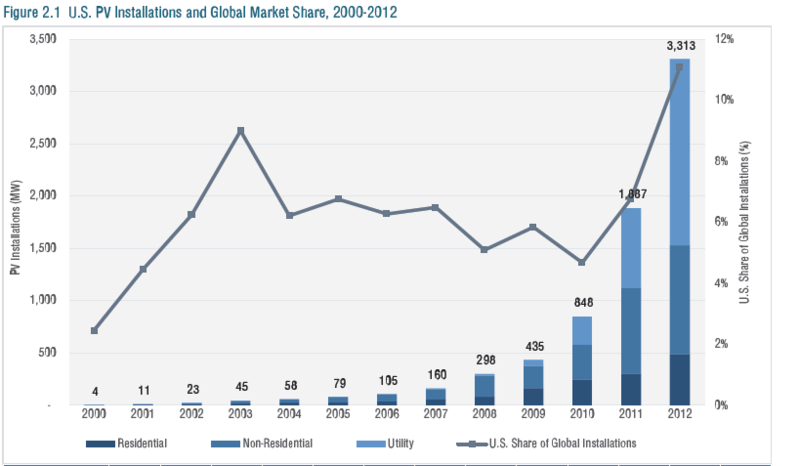 Most solar jobs – more than 57,000 – are on the installation side. Other positions include manufacturing, sales, and management. Increasingly common sights on rooftops and in fields across the country, photovoltaic cells directly convert sunlight into electricity, helping lower electric bills for homeowners, farmers, and businesses. 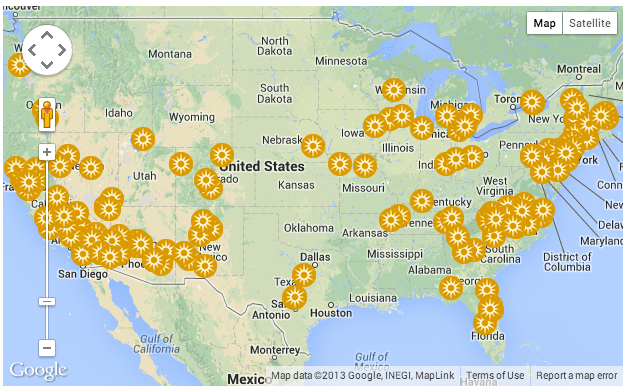 Larger, utility-scale solar developments are being built on land with limited economic value. For example, in California’s Antelope Valley, a Berkshire Hathaway subsidiary is developing the world’s largest solar farm. 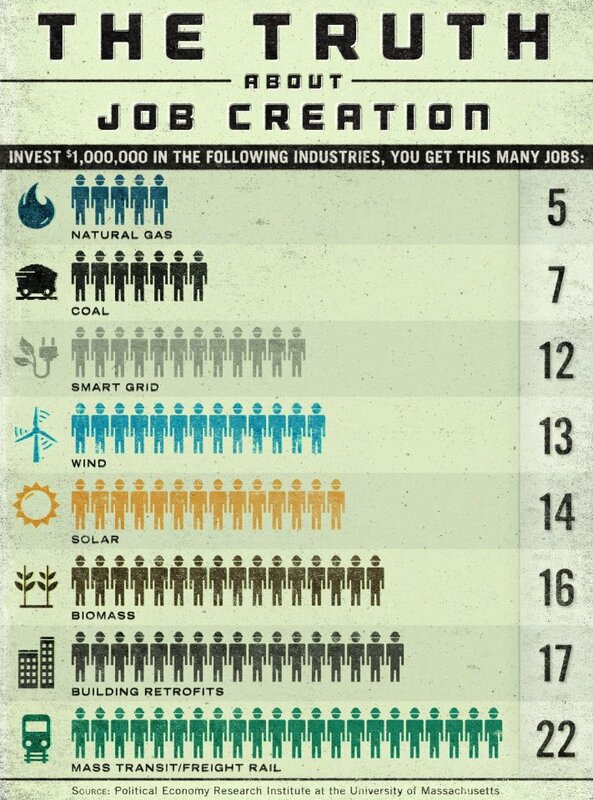 As I noted at the top, the fact that solar does so well in the job creation field for each $1 invested is of course important and one of the reasons why solar is leading the way in job creation. 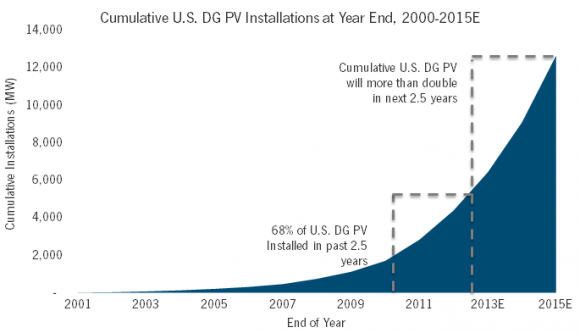 However, another key fact is simply that the US solar power sector is growing very fast. “The United States surpassed 10 gigawatts (GW) of installed solar power in the first half of 2013, which is enough to power around 2 million homes, joining the ranks of Germany, Italy, and China with double-digit GWs of solar capacity,” E2 wrote in the new report. Naturally, this massive solar power boost (and the subsequent solar jobs boost) is not simply a coincidence. You don’t get charts like those above for no good reason. Solar power is growing fast because the cost of solar panels has fallen dramatically, making electricity from one’s own solar power system actually cheaper than electricity from the grid for millions (or even hundreds of millions) of people and businesses. But there are many other advantages to solar power that also help to make solar an obvious choice for those who have the option. In the article linked above, I actually count eight considerable advantages to solar energy versus zero considerable disadvantages. Though, again, it all comes down to cost for most people. The reason solar is finally skyrocketing is because it is cheaper than alternatives and offers a very competitive return on investment (for those who would like to view it as an investment and weigh it against other high-return investments). In 13 states (see the link above), going solar actually beats the S&P 500 in terms of IRR. In 43 states, it beats a standard 5-year CD. Anyway, for you, it all comes down to the specifics of your home or business, your state’s incentives, the local or regional installers who could put solar on your roof, and so on, so just get a freakin’ quote so that you can help spur along the solar jobs boom while benefiting financially yourself.